Prior to summer 2018, MoveIt only had a single stable motion planning library as its core motion planner, i.e. OMPL. As a part of this GSoC project, motion planning support was extended by making other motion planners (CHOMP) more stable and porting STOMP also to be a part of the MoveIt motion planners family. The MoveIt part of STOMP was ported from the ros-industrial/industrial_moveit repository into moveit/motion planners. Furthermore, benchmarking package was made to work with other motion planners in addition to OMPL and tutorials for the same were added. Planning Request Adapters were extended to include motion planners like CHOMP, STOMP to be used as an additional step with OMPL or other motion planners to produce better trajectories in different situations. Tutorials for Planning request adapters for also added in moveit_tutorials repository. *Project sponsored by Google Inc.
Indoor Localization is a primary task for social robots. We are particularly interested in how to solve this problem for a mobile robot using primarily vision sensors. This work examines a critical issue related to generalizing approaches for static environments to dynamic ones: (i) it considers how to deal with dynamic users in the environment that obscure landmarks that are key to safe navigation, and (ii) it considers how standard localization approaches for static environments can be augmented to deal with dynamic agents (e.g., humans). This project aims to build a GUI app to benchmark the performance of various detectors and descriptors like KLT, Harris Corners, FAST, SIFT, SURF, AKAZE, LSD Detectors and SIFT, SURF, ORB, Polar Image, LogPolar Image, Spin Image and BLD desriptors. Various detectors / descriptors combinations can be used to evaluate vision tasks like Visual Odomtery, Place recognition and Tracking using the app. 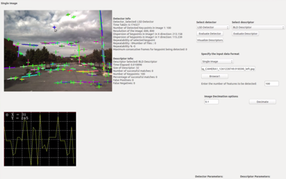 Another follow-on mini project is extending existing ROS packages to playback MRPT datasets. This project involves tracking and following a human by a mobile robot. The robot needs to follow the human and keep a set distance with respect to the human. An online CNN is being used here. The Robot Operating System (ROS) is used. The sensor used is a Point Grey Bumblebee2 Stereo camera and the ZED Stereo Camera. * Finalist for Best Paper Award at ICVS 2017. This project involves tracking and following a human by a mobile robot. The robot needs to follow the human and keep a set distance with respect to the human. A modified Online boosting tracking algorithm is being used for tracking. The robot follows the human wherever it goes. The Robot Operating System (ROS) is used. The sensor used is a Point Grey Bumblebee2 Stereo camera. won the best Robotics Paper Award at 14th Conference on Computer and Robot Vision, 2017. In this project we aim to develop a system that can solve the problem of free space estimation for autonomously driven cars. Free Space in the context of autonomous driving is defined as the collision-free space in which the car can freely navigate which means it has no obstacles (other cars, humans, buildings, trees, pavement, etc.). Finding free space implies getting rid of all other obstacles apart from the space where the car can drive without collisions which is the road. An occupancy grid based approach is used and a RANSAC based model to d﻿etect dynamic objects is proposed. The aim of this project is to find patterns for a specific factor like threat detection, infectious diseases, Violence, etc. In this project we use PMI and word embeddings to compute a Factor score and analyse its trend over a period of time. It deals with generating a Factor Score by using semantically similar words to the factor and compute the score of that particular Factor for each day. We focus on the 'Violence' factor here. This primary aim of this project is to design and develop an ImageJ plugin based on the existing plugin- "TurboReg". TurboReg is used for automatic alignment of source image to a target image. The multiple version of TurboReg is StackReg. StackReg is concerning standard software package in the neuroscience community to realign time-lapse calcium imaging to infer the neural spike dynamic. StackReg has several drawbacks that limits the practical usage for large and multiple-channels datasheets because it was not primarily develpoed for long time-lapse of images. The project has the goal of implementing a wrapper to TurboReg for time-lapse images and to add-on functionality which will allow automation of the pre-processing tasks and improved reproducibility of the results. This project uses ImageJ which is an open source Java based image processing program extensively used in life sciences. The TurboReg plugin is widely used in Neuroscience for pre-processing of both statuc and time-lapse imaging data. The aim of the project is to develop a place recognition system for a mobile robot so that it may localize itself and use knowledge of places to determine its actions. The robot learned places from experience so that it might recognize previously observed topological places in known environments or categorize previously unseen places in new environments. This system was deployed on a mobile robot to verify the theoretical results practically. The project focused on implementing vision algorithms for mobile robot to develop a system that can perform the task of place recognition and place categorization. The work involved developing a descriptor (similar to SIFT, SURF, HOUP, etc.) for images and using the descriptor to extract features to be later used in classification tasks using algorithms like support vector machines, k-nearest neighbors, etc. The system was then tested using the mobile robot to help it localize itself. The practical implementation and results played a crucial part in the project. Programming platforms used were Matlab and C++; the Robot Operating System for integration of the system with the robots. * paper published in 13th Conference on Computer and Robot Vision 2016, June 1-3, 2016, Victoria, BC. This project is in the field of Space Robotics in which a team of robots was trained for the task of foraging an area. My work involved practically testing the Algorithms and developing the experimental set up for the robots to complete the task of picking up small items from a large area and depositing them in the target zone in shortest possible time. This involves use of arduino micro-controller, cameras, localized sensors on board (micro-switches, SONAR, XBee, on board camera, shaft encoders) etc. which aid the rovers in picking up items from the given area. Collective, Collaborative and Co-operative behavior was ensured between the robots. ** work presented at the Birds of a Feather Session NCFRN Field Trials Kelowna June 13, 2015. In this project we aim to track a moving object taken from an image sequence. The object could be a book, a human, swimmer, skater, a vehicle or anything that can exhibit motion. We target at tracking objects in videos taken from a fixed and a moving camera. We track single objects and multiple objects in both cases. Previous Research has provided evidence that a combination of static code metrics and software history metrics can be used to predict with surprising success which files in the next release of a large systems will have largest number of defects. In contrast, very little research exists to indicate whether information about individual developers can profitably used to improve predictions. The goal of this project is to determine whether information about which particular developer modified in a file are able to improve defect predictions. We also continue an earlier study to evaluate the use of counts of the number of developers who modified a file as predictors of the file's future faultiness. This project involved using high quality cameras to detect suspicious items. It involved implementing image stitching algorithms, image matching algorithms and Machine Learning algorithms. Image Stitching was done by detecting interest points and then combing the image based on the common boundary. SURF algorithm and correlation was used for image matching. A prototype of the actual product was created in this project. This project was a part of our New Venture (Start-up) and the product would be sold to malls, hotels, hospitals, government institutions and other such places. This was a part of a course New Venture Creation, through this course we interacted with the founders of various successful start-ups like exotel, gharpay, redbus, grey orange robotics, etc. This is a live group project which involves development of acquisition and analysis modules for cloud forensics. Initially framework was designed followed by development of various modules of the too and finally the tool was tested for various investigative scenarios in IaaS (Infrastructure as a Service) test bed environment. Python was used as the coding platform. This project involved using video processing algorithms to detect presence of pedestrians in videos. This project involved creation of a Device which can test for a urinary tract infection in a given urine sample. Machine was made using arduino micro-controller, motors, imaging sensors, etc. My job was to come up with an algorithm based on prior data given to generate a formula for Tubidity of the urine essay given. It involved finding similarity between given data (RGB and clear filter values). My work also involved creation of a website for the start-up company for this product rightbiotic. This project involved creation of a web based application for "Predicting trending topics in twitter" using machine learning algorithm and data Mining techniques. Data was extracted using TAGS library. Coding platform used was R. R shiny was used on the front end for the web application. This involved computerizing an already existing manual system by creating a real time software to allow smooth flow of applications for funding safety research programs. Project required developing code for both internet as well as intranet side. Whole of this code was deployed and tested on the intranet and internet side. Project involved creating a proper database for the system from scratch (ER diagrams, class diagrams, etc.) in MS Access. Then using the particular database some constraints were coded as per the requirement of the system. Basically dealt with concepts of web development and managing huge data bases. Coding Platform used was JSPs and Servlets. Above listed are the major projects completed by me during my bachelor studies. Other small projects undertaken by me through the course of my undergraduate studies can be found here.